To say H&M has had a difficult week is putting it mildly. As widely reported, the fast fashion retailer temporarily closed its 17 stores in South Africa after outrage over an advertisement in which a young black child was shown sporting a sweatshirt emblazoned with the words “Coolest Monkey in the Desert.” Outrage quickly spread digitally across social media and in person outside of H&M’s South African locations. The stores were overwhelmed by demonstrators who toppled displays and left piles of clothing behind in protest; even though the stores are still closed, as of press time protests were still continuing. H&M tried to apologize and staunch the controversy, but those words were far too late for those angered by another tone-deaf ad – not to mention how people of African descent are fed up with the centuries of simianization that has long festered in popular culture. It didn’t matter that the child model’s family, who lives in Sweden, defended the sweatshirt ad. Critics of the company are asking why this ad campaign was not thoroughly vetted. 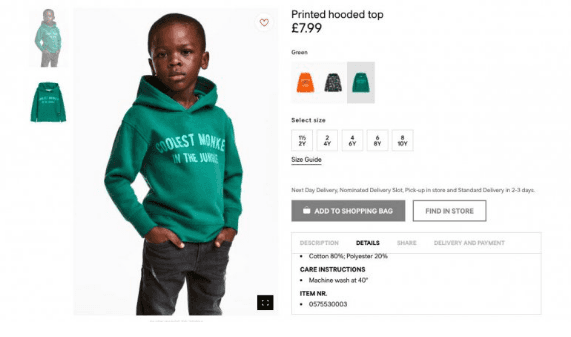 Furthermore, South African law has set a low bar when it comes to determining when a person or entity makes a racist remark – hence not only has this sweatshirt ad put H&M’s reputation on the line, but has hurled the company in legal trouble as well. Over the past week, H&M agreed it would present South Africa’s human rights monitor with a plan to address the outrage the sweatshirt advertisement quickly sparked. One group that has been leading protests against H&M, the Economic Freedom Fighters, has so far refused to attend such meetings. It will be a tall order for H&M to rebuilt its reputation in South Africa. The fast fashion pioneer joins a long roster of companies accused of being racist or at a minimum, clueless – troubles that have sidetracked brands from Dove to Airbnb. But the lesson of this story is that companies need to be agile in how they can address such firestorms, says one author. Local media reports say H&M will soon launch anti-racism programs; but it has been too late for some celebrity endorsers who have quit their partnerships with the company.